Styled for hunt, cross country and the show ring. 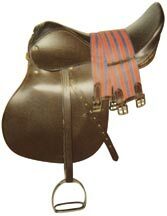 This saddle will fit most horses, (wide back or high withered). Havana brown leather. Sizes 16", 17", 18" or 19" seats. Imported.